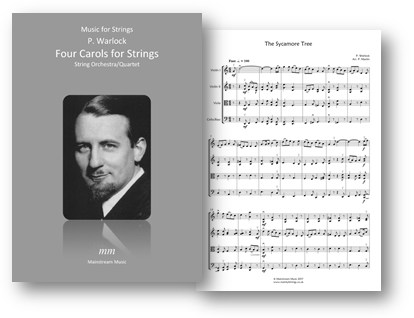 A series of four carols by Peter Warlock arranged for string orchestra /quartet by Peter Martin. The carols work well when combined into a four movement suite. All four carols are available to purchase separately. Click on the links below to view each carol. Each PDF contains part for violin III, doubling that of the viola, and a separate double bass as required. All four carols are available to purchase separately. Click here to listen to a recording of the four pieces. Click on the image below to visit the page.